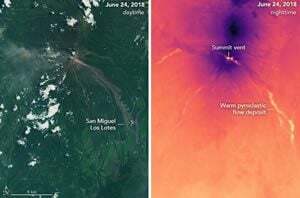 On June 3, 2018, torrents of hot ash, rock, and gas poured down ravines and stream channels on the slopes of Volcán de Fuego—Guatamala’s Volcano of Fire. More than three weeks after the eruption, the Landsat 8 satellite continued to detect elevated temperatures in some of the pyroclastic flow deposits. Read more at NASA Earth Observatory. 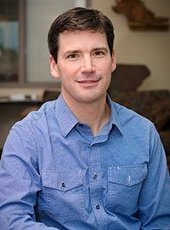 Rudiger Escobar-Wolf (GMES) is the principal investigator on a project that has received a $115,024 research and development grant from the National Science Foundation. Simon Carn (GMES) and Michigan Tech alumna Lizette Rodriguez Iglesias, PhD ’07, are Co/PIs on the project “RAPID: Lethal Pyroclastic Density Current (PDC) Generation and Transport at Fuego Volcano.” This is a one-year project. This Rapid Research Response (RAPID) award will be used to better understand the deadly eruption at Fuego volcano (Guatemala) on June 3rd, 2018, and in particular the pyroclastic density currents (PDCs) that caused the fatalities. How those PDCs initiated, what caused them to move that far, and what could be the conditions under which they may form in the future, are all poorly understood issues. By looking at the PDCs deposit, mapping them and study their stratigraphy in the field, analyzing the the chemical, petrological, and physical characteristics (density and vesicularity, grain size distribution, etc. ), and by using numerical models to understand their flowing dynamics, this team hopes to be able to tell where the PDCs material came from, and how it was fragmented and transported. They will also look at geophysical and geochemical monitoring data leading up and during the eruption, particularly from the local seismic network and satellite remote sensing data, to characterize other aspects of the eruption as well (eruption intensity and duration) and put the PDC information in that context. This knowledge will improve our understanding of the formation of this kind of PDCs, particularly at basaltic volcanoes like Fuego, and could be relevant to many other similar volcanoes worldwide and in the US. 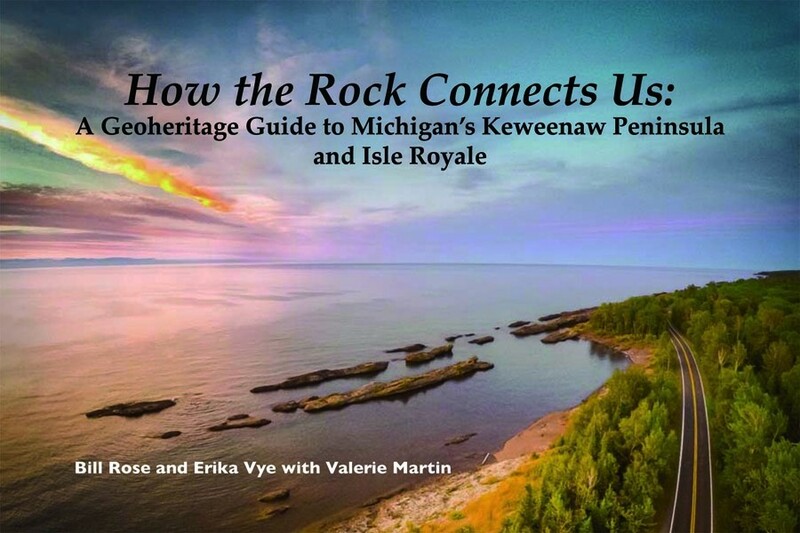 Erika Vye and Bill Rose will give a presentation on how Isle Royale and the Keweenaw Peninsula have a rich cultural, industrial, and mining heritage, all connected by their geologic underpinnings. 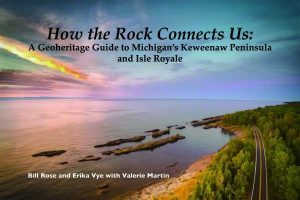 Interested in exploring the geology of the Keweenaw and Isle Royale this summer? Join Erika Vye and Bill Rose to learn about exciting geosites in our area, upcoming tours, and how to navigate their new geoheritage field guide. Daniel Lizzadro-McPherson will also join to showcase a Story Map he developed highlighting Isle Royale geology during a National Park Service Geoscientist in the Park internship. The book will be available for sale, and proceeds from this sale will support library services. This event is sponsored by the Friends of the Calumet Public Library. The book signing and presentation will take place at on Wednesday, June 27, 2018, from 6:30 to 8 p.m. at the Calumet Public Library. Winning reviewers were selected by the editors of each journal for their work. Editor M. Bayani Cardenas cited Waite for his service to Geophysical Research Letters. Read more at Eos, by Brooks Hanson and Lisa Tauxe. The presentation was co-authored by Evgeniy Kulakov, University of Oslo, Chad Deering (GMES) and Jim Moore. 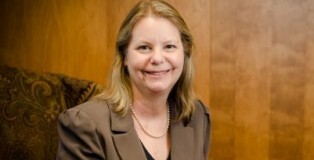 Bornhorst also served on the 2018 institute’s board of directors that met during the meeting. Darlene Comfort, Office of the Vice President of Administration, served as registrar for the meeting through the museum. Michigan Tech Alumnus Michael Neumann, a director with New Age Metals, was featured in the article “New Age Metals—Developing PGM and Lithium Properties in Canada,” in Investing News Network. Neumann graduated in 1981 with a Mining Engineering degree from Michigan Tech. He has been Proprietor of Neumann Engineering and Mining Services, Inc. since 1993. 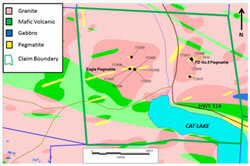 New Age Metals Inc. is a green metals exploration company currently developing its flagship River Valley platinum group metals property in Sudbury, Ontario, Canada. Read more at Investing News Network. Simon Carn (GMES) was quoted in the article “Sulfur Dioxide Leaks from Kilauea” in Earth Observatory. The article looks at the impact of the eruption and lava flow from the Kilauea volcano in Hawaii. Kilauea has been erupting continuously since 1983, but in late April and early May 2018 the volcanic eruption took a dangerous new turn. In addition to seismic activity and deformation of the land surface, another sign of volcanic activity is increased emission of sulfur dioxide (SO2), a toxic gas that occurs naturally in magma. “Interpreting the satellite SO2 data for events like this is complicated because there are multiple SO2 sources that combine to form the volcanic sulfur dioxide plume,” said Simon Carn, a volcanologist at Michigan Tech. Simon Carn (GMES) was quoted in the article “The lava striking the sea is gorgeous — and can be deadly,” in The Verge. 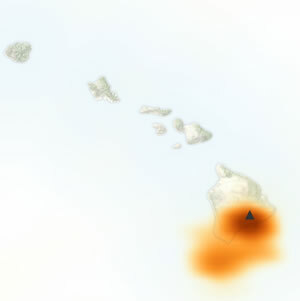 Carn commented on the results when lava from a volcano strikes seawater. The story was picked up by several media outlets including the Las Vegas News and Dotemirates. Simon Carn (GMES), was quoted in the article “Kilauea Lava Flows Hit the Ocean, Creating Toxic Acid Steam Clouds” which looks at the effects of lava from the Kilauea Volcano hitting the ocean. Research from Michigan Tech regarding the volcano was mentioned in Radio Canada. 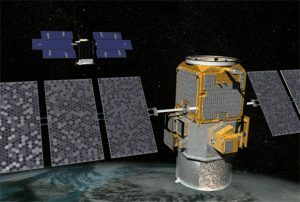 CloudSat and CALIPSO Pairing, courtesy of NASA. Mark Kulie (GMES) is attending the NASA CloudSat/CALIPSO Annual Science Review meeting in Boulder, Colorado. The meeting runs April 23-25, 2018. Kulie will present a talk entitled “Modern Global Snowfall Datasets: CloudSat’s Contribution.” This talk summarizes many recent and ongoing collaborative projects to develop and optimize global snowfall datasets using satellite observations. Mark Kulie (GMES) and Lisa Milani (GMES) recently authored a manuscript entitled “Seasonal variability of shallow cumuliform snowfall: A CloudSat perspective“. This article was published in the Quarterly Journal of the Royal Meteorological Society. The study illustrated the global seasonal cycle of lake/ocean-effect snow using satellite-based radar observations. Extract: Cumuliform snowfall seasonal variability is studied using a multi‐year CloudSat snowfall rate and cloud classification retrieval dataset. Microwave radiometer sea ice concentration datasets are also utilized to illustrate the intimate link between oceanic cumuliform snowfall production and decreased sea ice coverage. 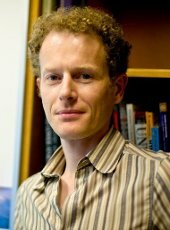 Simon Carn (GMES) was cited in the article “Ambae volcano ERUPTION: Mass evacuations ordered as volcano threatens to blow,” in Express. 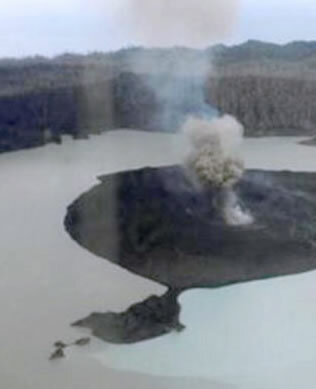 The article deals with the increased activity and potential evacuation of thousands of households near the Ambae volcano on the island nation of Vanuatu in the South Pacific. A large sulphur dioxide plume was emitted from Ambae in early April and it may have emitted the most sulphur dioxide of any eruption since the 2015 eruption at Calbuco in Chile. It was noted by Simon Carn, a volcanologist and professor at Michigan Tech. Dr Carn said a significant amount of ash was emitted during one of these eruptions and pictures on Twitter show the extent of ash on the island, which suggested it was a pretty large eruption. Ambae volcano is a very large volcano and is frequently active. 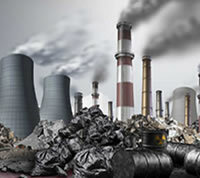 In its recorded history there have been many eruptions – every 10-50 years over the past 150 years. All these eruptions have been from the summit craters, except one recorded in the 1670s. Michigan Tech Provost and Vice President for Academic Affairs Jacqueline Huntoon was interviewed for the article “The Importance of Teaching Earth Science,” reprinted in teachmag.com. The article originally appeared in the Jan./Feb. 2018 edition of TEACH Magazine. Earth science has long been the poor cousin of STEM programs. It takes a back seat to technology and even among the straight sciences, rocks and rivers get short shrift alongside the physical sciences—properties of matter, motion, gravity. “A lot of the topics that are part of an earth science curriculum are relevant to a person’s daily life,” said Jacqueline Huntoon, provost at Michigan Technological University. She has been helping to develop the new middle school science curriculum Mi-STAR, for Michigan Science Teaching and Assessment Reform. Her approach relies heavily on hands-on experience. Read more at TEACH Magazine, by Adam Stone.